The vast majority of pollution-related deaths are linked to fine particles less than 2.5 millionths of a metre (known as PM2.5). PM2.5 behave like gases and, like the air we need to breathe, enter our homes even when all doors and window are shut. If breathed in, PM2.5 can penetrate the deepest recesses of our lungs, cross into the bloodstream and transport toxins to every organ of the body. Worldwide, PM2.5 pollution is estimated to cause 8.9 million premature deaths a year (18,000 in Oceania) . As our knowledge of the effects of PM2.5 pollution increased, so have estimates of pollution-related deaths, up from 3.2 million in 2012 . The latest estimates were derived from studies with accurate air pollution data from land-based measurements, combined with satellite data or information from land-use regression models  – 41 cohorts in 16 countries, with PM2.5 ranging from 2.4 to over 80 ug/m3. 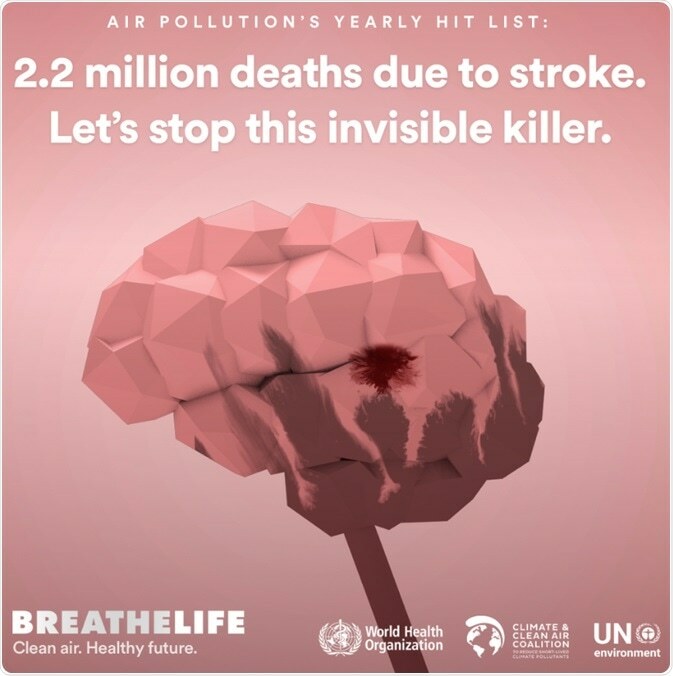 As well as total deaths, specific causes were considered: stroke (see the WHO BreatheLife infographic ), ischemic heart disease, COPD, lung cancer and lower respiratory infections . Both outdoor air pollution and particulate matter (a major component of air pollution) were classified in 2013 by the International Agency for Research on Cancer as a carcinogenic to humans (Group 1) . In addition to lung cancer, PM2.5 is linked to kidney and bladder cancers , breast cancer [6, 7] and, in HPV-positive Honduran women exposed to wood smoke in their kitchens, cervical cancer . The mechanisms underlying the adverse health effects of air pollution include systemic inflammation and oxidative stress. These mechanisms are also involved in the pathogenesis of dementia . Particles less than 0.2 microns can enter the brain directly via the olfactory bulb, as demonstrated by the presence of magnetite particles in human brains . The two major sources of PM2.5 (wood smoke and traffic PM2.5) are small enough to enter the brain directly, because their size distributions peak at approximately 0.1 to 0.2 microns, smaller than cigarette smoke particles, which peaks at 0.3 to 0.4 microns [11, 12]. Several studies show PM2.5 pollution reduces cognitive function. In a representative sample of 13,996 US residents over 50, PM2.5 exposure was associated with reduced general cognitive function ; PM2.5 was also associated with lower scores in the California Verbal Learning Test in 1496 residents in the Los Angeles Basin  and in 798 residents of the Ruhr, Germany, PM2.5 reduced semantic memory and visuo-construction . In Mexico, where PM2.5 averaged 6.99 (first third), 11.75 (middle third) and 20.26 μg/m3 (top third of PM2.5 exposure), the effects of a 10 μg/m3 increase in PM2.5 (on 7,986 adults aged at least 60 years) was highly significant and comparable to several years of aging . 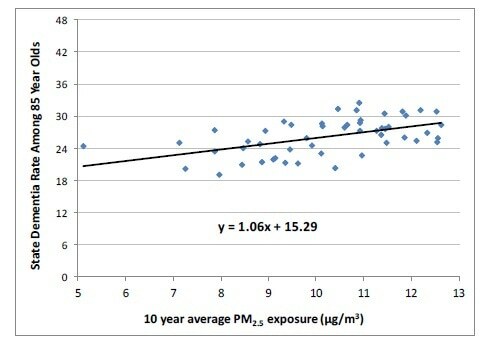 In China, particulate air pollution was reported to cause “huge reductions in intelligence”  and that a reduction in “annual mean concentration of particulate matter smaller than 10 μm (PM10) to 50 μg/m3 would move people from the median to the 63rd percentile (verbal test scores) and the 58th percentile (math test scores), respectively … air pollution likely imposes substantial health and economic costs, considering that cognitive functioning is critical for the elderly for both running daily errands and making high-stake decisions” . The women’s Health Initiative Memory Study (WHIMS) measured brain volumes by structural MRI scans of 1,403 women without dementia who were living in the community. After adjusting for intracranial volumes and potential confounders, increased PM2.5 exposure of 3.5 ug/m3 was estimated to reduce the volume of white matter in the brain by 6.2 cm3, equivalent to 1-2 years of brain aging . Another MRI study measured brain volumes of 943 residents of New England, USA, finding that, for people over 60, increased PM2.5 exposure of just 2 μg/m3 was associated with a 0.32% smaller total cerebral brain volume and a 46% higher risk of covert brain infarcts, a type of silent stroke . One in six people in Australia will be affected by stroke. It is the nation’s leading cause of disability . For 9.8 million Medicare recipients in 50 north-eastern US cities, a 5 ug/m3 increase in city-wide PM2.5 exposure doubled the risk of hospital admission for Alzheimer’s, with a 46% increase for dementia and 44% for Parkinson’s disease . A 5 ug/m3 increase in PM2.5 exposure was estimated to increase dementia by 6.5 percentage points (33.5% of the mean, see graph, below © Bishop, Ketcham, and Kuminoff ) in another large study of 6.9 million US residents over 65, in which the average dementia rate in was 19% in 2013. Much worse for APOE 4 genotypes. The WHIMS study had information on the genotypes of 3,647 of its participants. Exposure to PM2.5 pollution above the US EPA standard of 12 ug/m3 was found to increase the risk of all-cause dementia respectively by 26%, 89% and 253% respectively for ε3/3, ε3/4 and ε4/4 genotypes, the latter representing a 3.53-fold increased risk. For global cognitive decline, the increased risks were 71%, 91% and 187% . In the UK, dementia is now the leading cause of death across all age groups, and genders . A report for Alzheimer’s UK suggests that about a third of those born in 2015 will die with dementia . Estimates for the USA are similar . Consequently, a 5 ug/m3 reduction in PM2.5 exposure (which could be achieved by tackling the two major sources of PM2.5 emissions – wood stoves and diesel vehicles) would have profound health benefits. Premature births are associated with brain alterations in early adulthood . The 18% increase in pre-term births attributed to PM2.5 exposure during pregnancy  is therefore likely to have adverse effects on brain development. The greatest effects appear to be for exposure during the 3rd trimester. For example, in Ohio, USA, PM2.5 pollution in the third trimester of pregnancy was associated with a 42% increase in stillbirths  and a 28% increase in pre-term births . Six studies report links between autism and PM2.5 exposure during pregnancy (mainly the third trimester) . The risk of autism was also increased by PM1 exposure in the first 3 years of life in a study in China – an 86% increase for a 4.8 ug/m3 increase (the inter-quartile range, IQR) in PM1. The effect of PM2.5 exposure was similar (79% for an IQR increase of 3.4 ug/m3) . Structural neuroimaging and cognitive function tests shed some light on these effects. In the Netherlands, 783 children were tested at age 6 to 10 years, after their mothers’ PM2.5 exposure was measured during pregnancy. Those with higher PM2.5 exposure during fetal life had thinner cortex in several brain regions of both hemispheres (e.g. the cerebral cortex of the precuneus region in the right hemisphere was 0.045 mm thinner). The reduced cerebral cortex in precuneus and rostral middle frontal regions partially mediated the association between PM2.5 exposure and impaired inhibitory control . Direct observations in metropolitan Mexico City from 203 consecutive autopsies of people aged 11 months to 40 years, who died suddenly from causes not involving the brain, provide additional evidence. Age and cumulative exposure to PM2.5 in excess of the USEPA standard 12 ug/m3 were significant predictors of neurofibrillary tangles in the brain . Even the 11 month old baby showed the presence of these abnormal proteins. The principle author of the study, a world expert on the effect of air pollution on the brain, said: “Alzheimer’s disease hallmarks start in childhood in polluted environments, and we must implement effective preventative measures early. It is useless to take reactive actions decades later” . In a 2018 policy forum paper published in the journal Science, Dr. Joshua Graff Zivin, professor at the School of Global Policy and Strategy and the Department of Economics at the University of California San Diego, noted that "There are a range of studies now that have shown that even a short amount of exposure to modest levels of pollution in utero and the first year of life leads to demonstrable impacts on intellectual performance on standardized tests in middle school, in high school … We also find from other studies that we even see the imprints of that exposure 30 years later on the earnings of workers. … Those same impacts at more subtle levels simply impair our ability to do every day tasks" . Dr Tedros Ghebreyesus, director general of the World Health Organization drew attention to the problem, advising in October 2018 that: “exposure to air pollution during pregnancy can damage a developing baby’s vital organs including the brain, heart and lungs and lead to a range of conditions including asthma, heart disease and cancers … Air pollution also negatively affects brain develop­ment during childhood, lowering children’s chances of success in school and employment possibilities later in life” . The Guardian discussed air pollution in November 2018: One of the biggest surprises air pollution researchers have encountered in the last decade is the huge impact of wood-burners on the air of western cities. “It has completely crept under the radar,” says Gary Fuller, at King’s College London. As many as 1.5 million stoves have been sold in the UK alone. The impact has been huge: 40% of particles in British cities are from wood burning, more than double that from vehicles. In Dublin, wood and peat burning can cause 70% of particles” . Unless polluters pay the health costs, society is subsiding unhealthy pollution. The European Environment Agency’s ‘Air Quality in Europe – 2018 report’ attributed 31,300 premature deaths in the UK to PM2.5 pollution, 9,700 to NO2 pollution and 590 to O3 , implying that over 75% of the health costs relate to PM2.5 exposure. Efforts to reduce pollution have so far focussed on vehicles, e.g. an Ultra Low Emissions Zone in Central London from April 2019. Vehicles that don’t satisfy Euro-6 (diesels) or Euro-4 (petrol) will pay £12.50 per day. Other major sources, such as wood stoves, are increasing, despite the fact that a single wood stove emits more PM2.5 in a few hours than the average petrol car in an entire year . Air pollution expert Gary Fuller commented: “even the cleanest stove produces 8 times as much pollution as a diesel truck ... In other words, having a neighbour with a wood burner is like having 8 trucks sitting in your street with their engines idling all night.”  Comparative studies indicate that wood stove pollution is at least as harmful as traffic pollution (see Appendix 2), so the benefits of decreasing PM2.5 will be similar, irrespective of whether it is achieved by removing 1,000 petrol cars, a few diesels without particulate filters, or a single wood stove. Europe encouraged diesels in the mistaken belief that it would help reduce global warming. However, an independent evaluation concluded that, as well as creating alarming levels of air pollution, the switch to diesels actually increased global warming . In 2015, a former minister admitted that promoting diesels was a mistake . Despite expert advice that wood stoves cause more global warming than non-polluting heating , and that even a carefully-operated wood stove burning dry wood has estimated annual health costs of £889 in inner London (for an average use of just 563 hours a year), there are few effective plans to address this issue. A UK Government briefing for Directors of Public Health cited a study in 2006 that found “reducing PM by 10 μg/m3 would extend lifespan in the UK by 5 times more than eliminating casualties on the roads, or 3 times more than eliminating passive smoking" . The true benefits are likely to be much higher, given the upward revisions in worldwide PM2.5-related deaths – from 3.2 million in 2012 to the current estimate of 8.9 million. 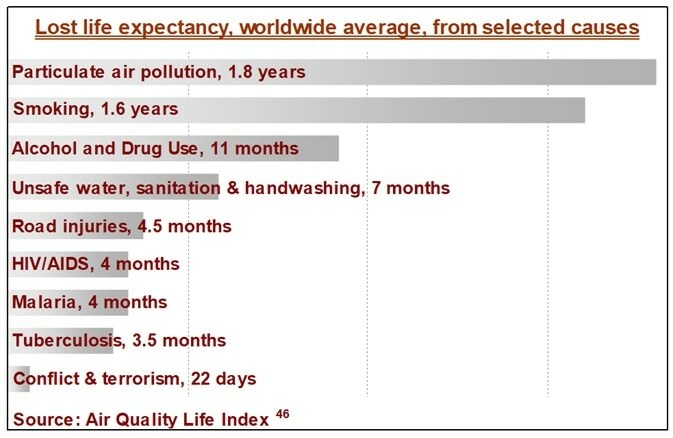 Worldwide, PM pollution is estimated to reduce life expectancy by 1.8 years compared to 1.6 years for smoking, 11 months for alcohol and drug use, 4.5 months for road injuries and 22 days for conflict and terrorism . Even in developed countries, low-cost actions can yield substantial benefits, e.g. a 28% reduction in wintertime deaths from respiratory disease and 20% reduction in cardiovascular disease deaths from a 40% reduction in PM2.5 pollution achieved by reducing wood smoke in Launceston, Tasmania . Health professionals played a vital part in discouraging smoking and creating smoke-free areas to protect public health. Some are now taking action on air pollution, e.g. the UK Health Alliance on Climate Change (which represents major medical bodies including the Royal College of Nursing, the British Medical Association and the BMJ) called on the UK government in November 2018 to introduce a new clean air act . The recent and increasingly convincing research linking air pollution to many harmful effects, including damage to brains (especially for APOE 4 genotypes), as well as the hearts and lungs of adults, children and babies, should reinforce this message and the need for continued action. By advocating for comprehensive strategies to reduce air pollution, starting with the most significant and harmful sources, health professionals could make a real difference. Greater health benefits would be achieved in terms of increased life expectancy, according to the UK research, than eliminating passive smoking or motor vehicle traffic accidents. 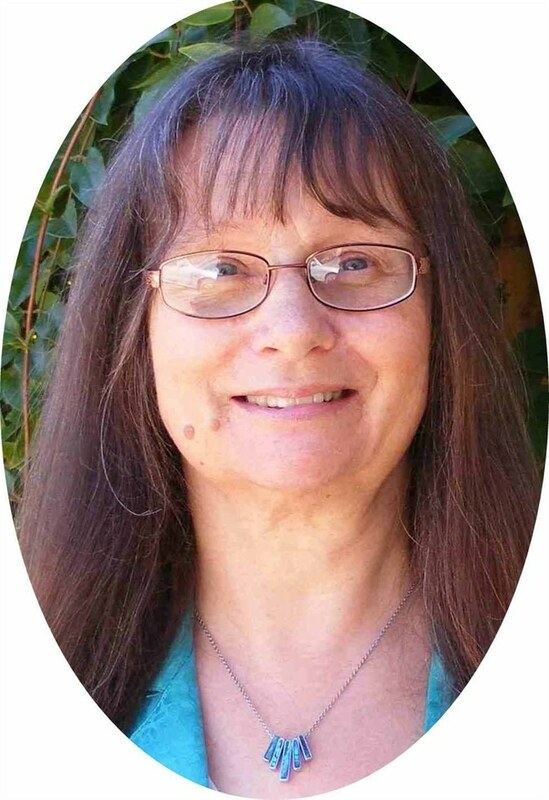 Dorothy L Robinson, PhD, BSc is a statistician/geneticist with interests in public health, epidemiology and the benefits of promoting health and preventing illness compared to the costs. She graduated with first class honours in mathematics from the University of Aberdeen and was awarded a PhD from the University of New England. Dorothy has published several peer-reviewed research papers on the safety and health benefits of cycling for transport and on air pollution and health. Appendix 1: no safe level of PM2.5 pollution – why have guidelines? Setting guidelines when there’s no safe level of PM2.5 pollution requires careful consideration of costs and benefits. The WHO guidelines (annual average of 10 ug/m3, maximum 24-hour average of 25 ug/m3) are a good start because more than 90% of the world’s population lives in places that don’t comply with them . However more should be done when the benefits of cleaning up the air exceed the costs, essentially the justification for the stricter PM2.5 standards in Australia of 8 ug/m3 (annual average) and 25 ug/m3 (24-hour maximum), reducing to 7 ug/m3 (annual average) and 20 ug/m3 in 2025 . The EEC is an interesting aberration – health costs were not fully considered when standards were set, resulting in considerable confusion; PM2.5 levels above WHO guidelines that cause significant health damage can still comply with current EEC standards, while NO2 levels that cause many fewer premature deaths can exceed them . To achieve the greatest public health gains, health professionals and other lobbyists should use relevant information on costs and benefits to recommend strategies that achieve maximum benefits for the available resources. Some studies have compared the health damage of PM2.5 from wood heating with traffic pollution. Independent effects of traffic and woodsmoke PM2.5 pollution on dementia were estimated in northern Sweden. Although the estimates had large standard errors, proportionately more PM2.5 came from wood stoves than traffic. A 1 ug/m3 increase in woodsmoke PM2.5 exposure was associated with a 55% increase in the risk of dementia, compared to a 14% increase for traffic PM2.5 . In Canada, for the 65+ age group, heart attacks increased by 19% for a modest 5 ug/m3 increase in 3-day mean PM2.5 pollution, noting "the association was stronger when more of the air pollution came from wood burning” . The 19% increase in heart attacks in the Canadian study is remarkably similar to the findings of Tasmanian researchers that hospital admissions for heart failure (HF, the leading cause of hospitalisation for adults aged over 65 years) started to increase as soon as woodsmoke PM2.5 exceeded 4 ug/m3, with a 5 ug/m3 increase in 3-day mean PM2.5 pollution increasing the risk by 13.5% . The vast majority of PM2.5 pollution in Tasmania originates from woodsmoke, so it was not possible to determine the effect of traffic. For lung conditions: "In the limited amount of studies that have been done so far that have directly compared smoke from fires with the same level of particulates and smoke from car exhaust, industry have all tended to show that the effects from the wood smoke are actually worse for lung conditions than a similar amount from, say, car exhausts" . In the UK, woodsmoke is now the major source of urban PM2.5 pollution. Despite only 7.5% of households using wood for some of their heating , domestic wood combustion accounts for 2.7 times as many PM2.5 emissions in the UK as all road traffic – trucks, buses, cars and motorbikes . In Sydney, wood is used as the main form of heating by less than 5% of households, but it is responsible for 25% of pollution-related premature deaths . 1. Burnett, R., et al., Global estimates of mortality associated with long-term exposure to outdoor fine particulate matter. Proceedings of the National Academy of Sciences, 2018. 2. Lim, S.S., et al., A comparative risk assessment of burden of disease and injury attributable to 67 risk factors and risk factor clusters in 21 regions, 1990?2010: a systematic analysis for the Global Burden of Disease Study 2010. The Lancet, 2012. 380(9859): p. 2224-2260. 3. WHO. Air Pollution infographics. 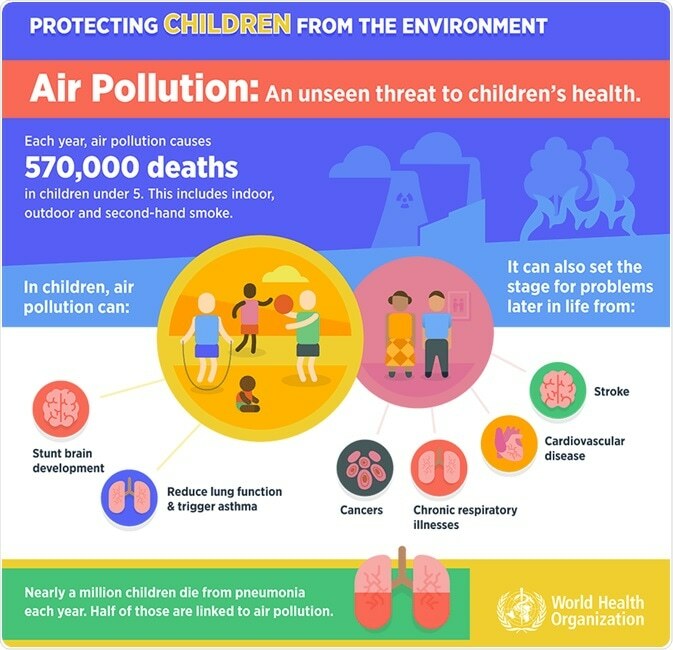 Available at: https://www.who.int/airpollution/infographics/en/. 2018. 4. IARC, International Agency for Research on Cancer. PDQ® - IARC’s Comprehensive Cancer Database. Outdoor air pollution a leading environmental cause of cancer deaths. World Health Organization. 2013. https://www.iarc.fr/en/media-centre/iarcnews/pdf/pr221_E.pdf. Accessed 25 Aug 2015, 2013. 5. Turner, M.C., et al., Ambient Air Pollution and Cancer Mortality in the Cancer Prevention Study II. Environmental health perspectives, 2017. 125(8): p. 087013. 6. Parikh, P.V. and Y. Wei, PAHs and PM2.5 emissions and female breast cancer incidence in metro Atlanta and rural Georgia. International Journal of Environmental Health Research, 2016. 26(4): p. 458-466. 7. Tagliabue, G., et al., Atmospheric fine particulate matter and breast cancer mortality: a population-based cohort study. BMJ Open, 2016. 6(11). 8. Velema, J., et al., Burning wood in the kitchen increases the risk of cervical neoplasia in HPV-infected women in Honduras. International Journal of Cancer, 2002. 97(4). 9. Shrourou, A. Alzheimer’s risk gene may play role in neurological effects of air pollution in children. Medical Net News. Available at: www.news-medical.net/news/20180906/Alzheimere28099s-risk-gene-may-play-role-in-neurological-effects-of-air-pollution-in-children.aspx. Medical Net News 2018. 10. Maher, B.A., et al., Magnetite pollution nanoparticles in the human brain. Proceedings of the National Academy of Sciences, 2016. 11. Kleeman, M.J., J.J. Schauer, and G.R. Cass, Size and composition distribution of fine particulate matter emitted from motor vehicles. Environmental Science & Technology, 2000. 34(7): p. 1132-1142. 12. Kleeman, M.J., J.J. Schauer, and G.R. Cass, Size and Composition Distribution of Fine Particulate Matter Emitted from Wood Burning, Meat Charbroiling, and Cigarettes. Environmental science & technology, 1999. 33(20): p. 3516-3523. 13. Ailshire, J.A. and E.M. Crimmins, Fine Particulate Matter Air Pollution and Cognitive Function Among Older US Adults. American Journal of Epidemiology, 2014. 180(4): p. 359-366. 14. Gatto, N.M., et al., Components of Air Pollution and Cognitive Function in Middle-aged and Older Adults in Los Angeles. NeuroToxicology, 2014. 40: p. 1-7. 15. Schikowski, T., et al., Association of air pollution with cognitive functions and its modification by APOE gene variants in elderly women. Environmental Research, 2015. 142: p. 10-16. 16. Salinas-Rodríguez, A., et al., Exposure to ambient PM2.5 concentrations and cognitive function among older Mexican adults. Environment International, 2018. 117: p. 1-9. 17. Carrington, D. and L. Kuo. Air pollution causes ‘huge’ reduction in intelligence, study reveals. The Guardian. Available at: www.theguardian.com/environment/2018/aug/27/air-pollution-causes-huge-reduction-in-intelligence-study-reveals 2018. 18. Zhang, X., X. Chen, and X. Zhang, The impact of exposure to air pollution on cognitive performance. Proceedings of the National Academy of Sciences, 2018. 115(37): p. 9193. 19. Chen, J.-C., et al., Ambient Air Pollution and Neurotoxicity on Brain Structure: Evidence from Women's Health Initiative Memory Study. Annals of Neurology, 2015. 78(3): p. 466-478. 20. Wilker, E.H., et al., Long-Term Exposure to Fine Particulate Matter, Residential Proximity to Major Roads and Measures of Brain Structure. Stroke, 2015. 46(5): p. 1161-1166. 21. Fisher, D. Testing for vision problems after stroke. Radio National. The Science Show. Available at: https://www.abc.net.au/radionational/programs/scienceshow/testing-for-vision-problems-after-stroke/6384094 2015. 22. Kioumourtzoglou, M., et al., Long-term PM2.5 Exposure and Neurological Hospital Admissions in the Northeastern United States. Environ Health Perspect; https://dx.doi.org/10.1289/ehp.1408973. 2015. 23. Bishop, K.C., J.D. Ketcham, and N.V. Kuminoff, Hazed and confused: the effect of air pollution on dementia. NBER Working Paper No. 24970. Available at: https://www.nber.org/papers/w24970, 2018. 24. Cacciottolo, M., et al., Particulate air pollutants, APOE alleles and their contributions to cognitive impairment in older women and to amyloidogenesis in experimental models. Transl Psychiatry, 2017. 7: p. e1022. 25. Norton, M. Achieving the WHO’s Global Action Plan for Dementia. Medical Net News. Available at: www.news-medical.net/news/20180628/Achieving-the-WHOe28099s-Global-Action-Plan-for-Dementia.aspx. 2018. 26. Alzheimer’s Research UK. One in three people born in 2015 will develop dementia, new analysis shows. Available at: www.alzheimersresearchuk.org/one-in-three-2015-develop-dementia/. 2015. 27. Gordon, S. A Third of U.S. Seniors Die With Dementia, Study Finds. Available at: www.medicinenet.com/script/main/art.asp?articlekey=168604. 2013. 28. Nosarti, C., et al., Preterm birth and structural brain alterations in early adulthood. NeuroImage: Clinical, 2014. 6: p. 180-191. 29. Malley, C.S., et al., Preterm birth associated with maternal fine particulate matter exposure: A global, regional and national assessment. Environment International, 2017. 101: p. 173-182. 30. DeFranco, E., et al., Air Pollution and Stillbirth Risk: Exposure to Airborne Particulate Matter during Pregnancy Is Associated with Fetal Death. Vol. 10. 2015. e0120594. 31. DeFranco, E., et al., Exposure to airborne particulate matter during pregnancy is associated with preterm birth: a population-based cohort study. Environmental Health, 2016. 15: p. 6. 32. AAQG, Children & Health. Available at: http://woodsmoke.3sc.net/children, 2018. 33. Chen, G., et al., Early life exposure to particulate matter air pollution (PM1, PM2.5 and PM10) and autism in Shanghai, China: A case-control study. Environment International, 2018. 34. Guxens, M., et al., Air Pollution Exposure During Fetal Life, Brain Morphology, and Cognitive Function in School-Age Children. Biological Psychiatry, 2018. 35. Calderón-Garcidueñas, L., et al., Hallmarks of Alzheimer disease are evolving relentlessly in Metropolitan Mexico City infants, children and young adults. APOE4 carriers have higher suicide risk and higher odds of reaching NFT stage V at ≤ 40 years of age. Environmental Research, 2018. 164: p. 475-487. 36. UM News. UM Researcher: Evidence Mounts for Alzheimer’s, Suicide Risks Among Children, Young Adults in Polluted Cities. University of Montana News. Available at: news.umt.edu/2018/04/041318alzh.php 2018. 37. Zivin, J.G. and M. Neidell, Air pollution's hidden impacts. Science, 2018. 359(6371): p. 39-40. 38. Ghebreyesus, T.A. Air pollution is the new tobacco. Time to tackle this epidemic. The Guardian. Available at: www.theguardian.com/commentisfree/2018/oct/27/air-pollution-is-the-new-tobacco-time-to-tackle-this-epidemic 2018. 39. Carrington, D., Air pollution: everything you should know about a public health emergency, in The Guardian. Available at: www.theguardian.com/environment/2018/nov/05/air-pollution-everything-you-should-know-about-a-public-health-emergency 2018. 40. EEA, European Environment Agency. Air quality in Europe — 2018 report. EEA Report No No No 12/2018. Available at: www.eea.europa.eu/publications/air-quality-in-europe-2018, 2018. 41. AAQG. Woodheater-Car Comparison. Australian Air Quality Group. http://woodsmoke.3sc.net/woodheater-car-comparison. 2018. 42. Page, M.L., We really must stop burning wood. New Scientist, 2018. 238(3180): p. 23. 43. Cames, M. and E. Helmers, Critical evaluation of the European diesel car boom - global comparison, environmental effects and various national strategies. Environmental Sciences Europe. Critical evaluation of the European diesel car boom - global comparison, environmental effects and various national strategies, 2013. 25(1): p. 15 Available at: www.enveurope.com/content/25/1/15/abstract. 44. Kollewe, J. UK government wrong to subsidise diesel, says former minister. The Guardian. Available at: www.theguardian.com/business/2015/oct/01/uk-government-wrong-to-subsidise-diesel-says-former-minister 2015. 45. DEFRA, Air Quality A Briefing for Directors of Public Health, 2017, Defra & Public Health England. Available at: www.local.gov.uk/air-quality-briefing-directors-public-health. 46. Greenstone, M. and C.Q. Fan, Introducing the Air Quality Life Index. Twelve Facts about Particulate Air Pollution, Human Health, and Global Policy, 2018, Energy Policy Institute at the University of Chicago. Available at: https://aqli.epic.uchicago.edu/reports/. 47. UTAS. Reduction in air pollution from wood heaters associated with reduced risk of death. University of Tasmania media release. . 2013; Available from: http://www.media.utas.edu.au/general-news/all-news/reduction-in-air-pollution-from-wood-heaters-associated-with-reduced-risk-of-death. 48. Taylor, M. Top UK health bodies demand new clean air act. The Guardian. Available at: www.theguardian.com/environment/2018/oct/28/top-uk-health-bodies-demand-new-clean-air-act 2018. 49. Hibberd, M.K.K.E.M. National air quality standards Australian State of the Environment Report 2016. Available at: soe.environment.gov.au/theme/ambient-air-quality/topic/2016/national-air-quality-standards 2018. 50. Emden, J. and L. Murphy, Lethal but legal: Air pollution from domestic burning, 2018, IPPR. Institute for Public Policy Research. Available at: www.ippr.org/research/publications/lethal-but-legal. 51. Oudin, A., et al., Association between air pollution from residential wood burning and dementia incidence in a longitudinal study in Northern Sweden. PLOS ONE, 2018. https://journals.plos.org/plosone/article?id=10.1371/journal.pone.0198283. 52. Weichenthal, S., et al., Biomass Burning as a Source of Ambient Fine Particulate Air Pollution and Acute Myocardial Infarction. Epidemiology, 2017. 28(3): p. 329-337. 53. Huynh, Q.L., et al., Association of ambient particulate matter with heart failure incidence and all-cause readmissions in Tasmania: an observational study. BMJ Open, 2018. 8(5). 54. ABC News. Wood smoke worse than car exhausts. https://www.abc.net.au/news/stories/2008/04/24/2226672.htm. 2008; Available from: https://www.abc.net.au/news/stories/2008/04/24/2226672.htm. 55. DECC, U., Department of Energy & Climate Change. Energy Trends: March 2016, special feature article - Summary results of the domestic wood use survey. Available at: www.gov.uk/government/publications/energy-trends-march-2016-special-feature-article-summary-results-of-the-domestic-wood-use-survey, 2016. 56. Robinson, D.L., Air pollution almost as bad as everyone smoking a cigarette a day BMJ Rapid response. Available at: www.bmj.com/content/360/bmj.k167/rr-3. 2018. 57. AAQG. Sydney - woodsmoke.3sc.net/syd. 2016.